© 2008 by Kelly Smith all rights reserved; content may not be copied, rewritten, or republished without authors written permission. Local electrical building codes must be followed during new construction or when remodeling a home. Code requirements vary by room. Building permits must be obtained. This is the fourth in a residential wiring series of articles. The previous article examined how to wire a utility room.Before that, wiring a bathroom. The article previous to that looked at wiring a kitchen. Although all cities or municipalities have their own building codes which vary by degree, the typical electrical building codes noted here are often found. Some electrical building codes are general to the home overall; others are very specific depending on the rooms purpose. This article will list common ones. The points made in this article provide usual electrical building codes. Check out your local codes for specificity. 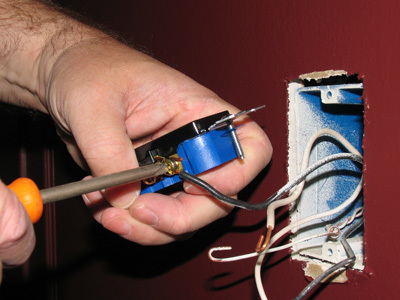 Understanding home wiring is important before doing any modifications as well as new installs. And, be aware that an electrical construction permit is usually pulled at your city hall or another municipal building. Periodic inspections will be made by the electrical building inspector. As I mentioned above, before you begin any wiring project, its important to understand home wiring concepts. Note that it is no longer acceptable for the main ceiling light to be activated with a pull chain; it must be a wall switch. A ceiling fan light may have a chain but it still must be connected to the switch. Each of these rooms has at least one entry door. Install a wall light switch near it. Your light switch must turn on either a a switched receptacle or a ceiling light fixture. Every wall shall have a minimum of one electrical receptacle. But there should be more than one for convenience; there shall be one available every 12 feet. All light fixtures shall be on a 15-amp circuit. The electrical building code for your kitchen is quite a bit more complicated than other areas of the home due to all the appliances. Generally speaking, receptacles that are above countertops and used for small kitchen appliances must be GFCI receptacles, controlled by two 20-amp circuits. Other receptacles are on 15-amp split-circuits. More sizable appliances like the garbage disposal, refrigerator, and dishwasher may need to be put on dedicated circuits. All kitchen lighting is on its own 15-amp circuit. Wiring a bathroom is simple. Since the bathroom is a wet area, youll be required to provide GFCI-protected receptacles. Lights shall be protected with a globe, lens, or something similar to keep moisture out. Depending on the amperage you consume, heaters, lights, as well as exhaust fans shall be on their own circuits. Any outside wiring is open to the elements. Because of that, either underground feed cable (UF) or sealed conduit shall be used. How deep should the conduit be buried? Thats something thats dependent upon local code. Investigate your local code. All fixtures shall be tightly sealed to keep water out. No-brainer here, folks. Interestingly, in some municipalities, no building permits are needed for the installing low-voltage lighting. Expect this to change. Closets are basic wiring jobs. One ceiling light shall be installed; and like your living room, pull chains arnt allowed, but a wall switch shall be used. The overhead light requirement is the same as for the closet. To find a licensed electrician in your area, see local ratings on who to hire for all your home projects. Angies List makes it easy to find the best. Join today. . I offer affordable article and blog-writing services. Interested? Hire Me! Website © 2008 KSmith Media, LLC; all rights reserved; content may not be copied, rewritten, or republished without written permission.